I have owned a Kindle since the first Kindle Keyboard was sold in 2007, and truth be told I would not have replaced my Kindle Keyboard 3G if the screen hadn’t broken and it was out of warranty. The Keyboard was more comfortable to hold than a hardback and actually read to you if you were tired. It didn’t have a built in light but the cover did and I had many hours of reading on it. Ignoring Amazon’s offer of money off a new Kindle, I bought a Kindle Touch 3G from eBay, with square trade 3 year warranty, which had special offers, as it was an unlocked model from the States and again had no built in light and a severely recessed screen. Out of all the Kindle e-readers I have to say the Touch was my least favourite. I absolutely despised the screen on it, it never seemed illuminated enough unless it was under fluorescent lighting. It was heavy and, just didn’t feel right to me. So I was overjoyed when rumours of the first Kindle Paperwhite circulated and I had the 3G model by the end of 2012. It was a huge improvement on the Touch 3G even with the uneven lighting at the bottom of the screen, a feature on which the critics slated it. The new generation Kindle Paperwhite 3G, I had at the end of last year had more even lighting than my first Paperwhite 3G but other than that there was very little difference practically between the two generations of Paperwhite. As much as I like the Paperwhite I have to agree with dissenters who criticise it for its poor build quality. My Paperwhite 3G second generation had to be replaced when the 3G didn’t work after 6 months and the replacement had some sort of adhesive bleeding through the bottom of the screen that again caused unevenness in the built-in lighting. Then I found that the battery life was considerably less than the 4 weeks as per the product description but with a number of reset steps from the esteemed Amazon Kindle engineers, this was eventually rectified. Now I have the new Amazon Kindle Voyage and truth be told if I found the Paperwhite as likeable as the Kindle Keyboard I don’t think I would have put in my pre-order by the end of the first day the new model hit the Amazon website. Like thousands of other eager new Voyage customers I waited impatiently for my Voyage to be delivered, which it was after 9 pm on November 4th and could not wait to settle my reading list onto it. The first noticeable difference was the size in packaging, I think the box is no bigger then an average paperback. 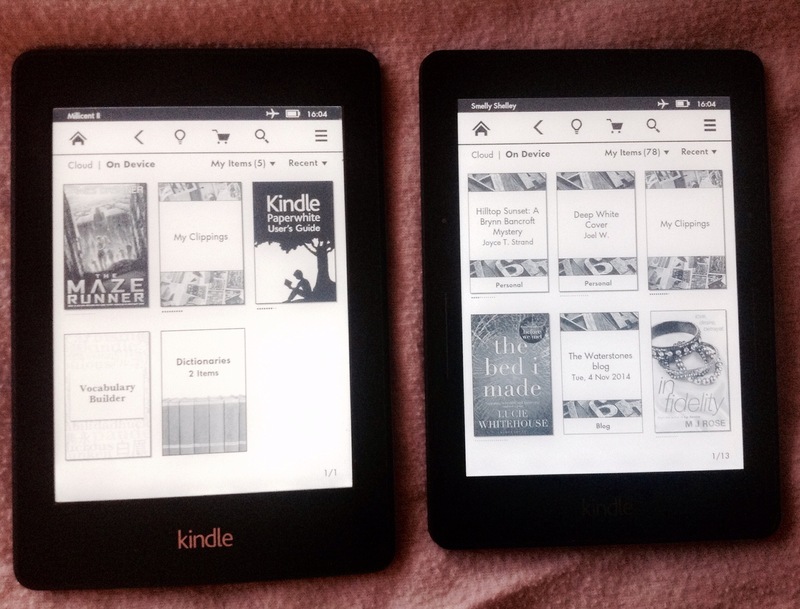 The Voyage itself is a bit smaller than the Kindle Paperwhite and definitely noticeably lighter. But the pièce de résistance has to be the new screen which is flush, brighter and clearer than any previous Kindle e-reader to date. The new Voyage feels more like a tablet you can read from comfortably, sharing the angled back design with its sibling the Fire. The self-adjusting light can be good when the light in the room fluctuates but a few times the built in light has just dimmed too much possibly because of the position in which I am holding the device, causing the sensor to deem light to be low. It has also inexplicably brightened when there has been no noticeable change in room lighting levels too. Fortunately I can manually override the auto-light sensor settings so it’s not a deal breaker. There are sensors on either side of the screen which detect pressure and turn the page giving you a buzz or feedback to indicate the page has turned, but as of now the position my hand needs to be to take advantage of this feature does not feel natural and I have undeniably small hands and I am not sure I like the haptic feedback. The position of the sensors to advance and reverse pages cannot be seen in the dark when the screenlight is recommended to be lowest. It is however, more comfortable to hold the Voyage as I would hold my Paperwhite and turn the pages via touching the screen as I am used to with Paperwhite ownership. The lighter weight of the Voyage makes it comfortable and more manoeuvrable. I also do like the button on the back to turn it on/off as opposed to the little button on the bottom, which always seemed a budget afterthought. I haven’t invested in the new Origami Cover for two main reasons. Firstly, the cover seems like it would add unnecessary weight to the device and I don’t read any ereader by placing it on a tabletop so the hand free stand seems rather redundant. Secondly, the case is extortionately expensive in my opinion. Forty pounds for an iPad case or a Kindle Fire HDX case I could understand, you could do with hands free and comfortable padding to hold these heavier devices but for an ereader, where I probably won’t even need the hands free option is unjustifiable to me. So the upshot of my rambling blog post today is I like the Kindle Voyage enough to not bother changing to a newer model if one happens to come along in 12 months. 3GKindle KeyboardKindle Paperwhite 3GKindle Touch 3GKindle Voyagemy personal review of the Kindle ereaders from Amazon.